This post is from Austin, Texas, America. Recently, i've moved to Austin, Tx, on a business trip. I'm currently in USA on B1 for about 3 months from 20th Aug 2008 to 17th Nov 2008. 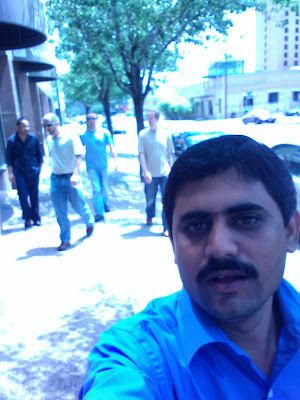 During this trip, i would be placed with our client GL Group, and study their technology practices. Once i go back to India, will start my own team to develop application for GL Group. 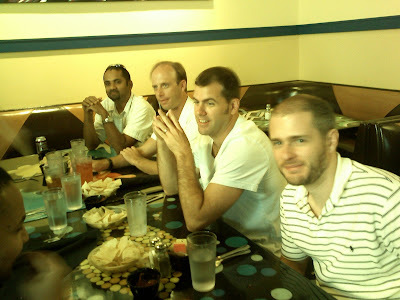 With in the current group am working with, there is a regular practice on Wednesday's, ie., Team Lunch. according to Mr. Mehar, SW Dev Manager (As his signature on mail says), it is optional that any one can attend and every one can attend. But every individual pay pay their own bills. And this day being my birthday as well, i thought to join them and give them a party. Mr. Mehar is so friendly and (honestly he is very kind / humble / down to earth / blah... blah .. what ever you can see in a matured personality) volunteered to pay the bill on my behalf. i guess it would be about $100, what ever is the bill, he took it on the bills of the organization. i dont know how.. but mentioned that. 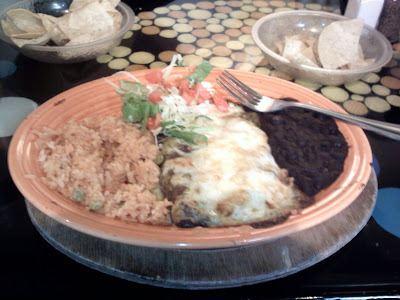 here are the few pics from the "Team Lunch"
This is the lunch that Mr. Mehar ordered for me. Aiden Povedano took this picture assuming that wanted to have every one. As i already took the one side of the table i wanted the other side. Anyhow, as this didn't come well, i've asked Aiden Povedano to take only the other side. the next one is some how better. 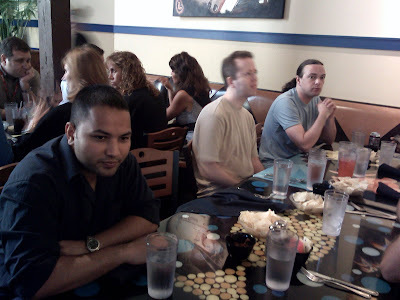 After lunch, Mehar and Elliot left early due to meetings, and we left behind. We are walking back from lunch. 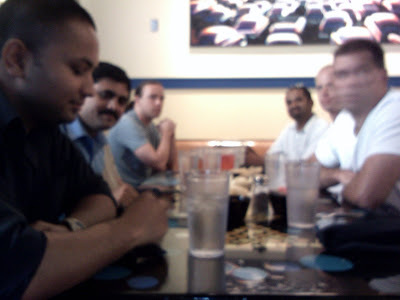 On 2nd August 2008, I've attended the mentioned meeting conducted by hySea at Motorola India office, located at Hitech City, Madhapur. The speaker of the event is Mr. Sudhakar Ramakrishna, Corporate VP and Head of Software for Home and Network Business, Motorola. He spoke about, "Leading Innovation.. the challenge for Leaders"
By sharp 8:25am, am there at the venue. It took about 7 minutes towards the security clearance and other formalities. And after that I'm straight away there for the conference room. To my surprise, as it is CEOs meeting, it should be that every one has to arrive late. Unaware of that, being the head for Indian operations of Obsys Technologies and never used to the CEO kind culture, looked for some one to receive me by the organizers. Though there is no one there to receive, Motorola's security person took me straight to their cafeteria. Slowly one by one joined me there, and started introducing one other. Then i got to meet big shots, and learned about their products as well as their companies. Incidentally in the crowd that am sitting are all live in US, and they are all here in India just for business. i felt alien in their crowd. Anyhow, managed. Later we proceeded towards breakfast. Breakfast includes, aloo based item + idly + vada with water melon juice. While we are breaking our fasting, there came a gentleman. Slowly talking to every one, except me. For some moment, I felt embraced. But later, recovered and ignored. To my surprise, this is the guy who is speaking that morning. Slowly after the breakfast, around 9:10am we reached the conference hall. After a small talk by some Motorola's senior person and introduction of Mr. Sudhakar, the actual talk started. Thus said, i do the same thing that every other does, but in my own style with more effectiveness. anyhow, let me not continue with my ideas. 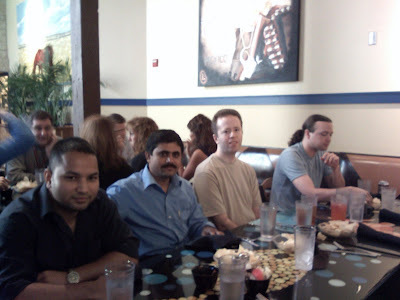 As this is the post all about the meeting and Mr. Sudhakar. According to Mr. Sudhakar, over the time the innovation becomes discontinues with in the organization. Hence the organization has to take the responsibility to dissolve such discontinuity. There is a necessity for the management to keep the innovation as a continues activity. One has to find different means and ways to keep the Innovation as a continuous process. He gave couple of examples out of his experience as how he made that a regular practice. Overall, that is a cool discussion that i ever had. But honestly, I don't know how all those high profiled people will nod their heads in this room and be dumb in their own work place. Anyhow, as i don't know them from their respective organizations, it is wise for me to be silent and play a diplomatic game.